Let's get to know the nine species of Indian vultures today on International Vulture Awareness Day. Usually considered repulsive and filthy by the layman, vultures are an object of the admiration of every bird lover and biologist, who knows of their indispensable role in nature. Once highly numerous, vulture populations in India took a steep, drastic plunge owing to the Diclofenac debacle of the 90s, endangering several species. Meet nine of India's majestic-looking janitors! A rather dandy-looking Vulture, the King/Red-headed Vulture is the kind of vulture that the ladies would eye at a vulture party. It is usually very dominant at carcasses, which is how it gets its title. The red head and lappets give it its characteristic regal appearance. The species is critically endangered. Thought vultures were just shabby-looking opportunists? Think again. 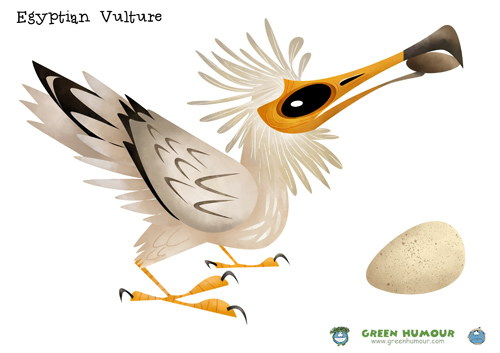 The Egyptian Vulture has the remarkable ability to use tools- pebbles for cracking eggs open and twigs to roll up wool to be used for its nest! The rooster-like appearance gives it the nickname 'Pharaoh's Chicken'. Egyptian Vultures are endangered today. Once our most numerous raptor, the White-backed or the White-rumped Vulture along with the Long-billed has been the worst victim of Diclofenac. The white ruff and rump define this raptor. White-backed Vultures are critically endangered today. The Long-billed or simply the Indian Vulture is a resident of rocky cliffs and hills of Peninsular India. Once numerous, it fell prey to Diclofenac and is now listed as 'critically endangered'. The Slender-billed Vulture is a resident of North-eastern India. Its noteworthy anatomy reminds us of evolution's constant masterpieces- an exaggeratedly narrow head and bill to facilitate better access to carcasses. Slender-billed Vultures were considered a sub-species of the Long-billed earlier but have now been split. The species is critically endangered. The Himalayan Griffon (along with the Cinereous Vulture) has the distinction of being the largest among Old World Vultures. Watching this mighty flying carpet soar along the Himalayan horizon is an enchanting sight for bird-watchers. Dead domestic yaks are the Himalayan Griffon's prime source of food. The species is near-threatened. The Eurasian Griffon lives in cliffs and crags in mountains and prefers open country. The pale head is a useful distinguishing feature. Griffons rely on carcasses of mountain ungulates and cattle for survival. 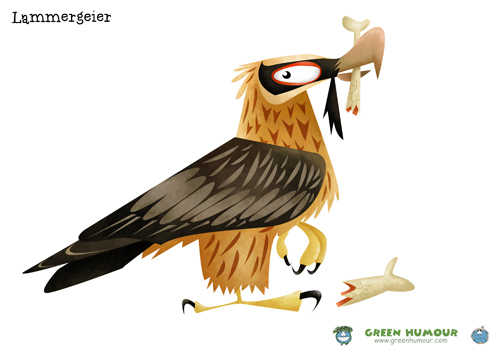 The Lammergeier or the Bearded Vulture is famous as the bone-breaker. Long before Newton formulated gravity, these physics wizards have been applying equations of their own to carry out the task of bone-breaking! The vulture feeds primarily on marrow from the bones of carcasses of large animals such as yak. Carrying the bone to the right height, the vulture drops it to a rocky surface to break it open. This skill takes several years to master! The species is classified as 'Near-threatened' today. 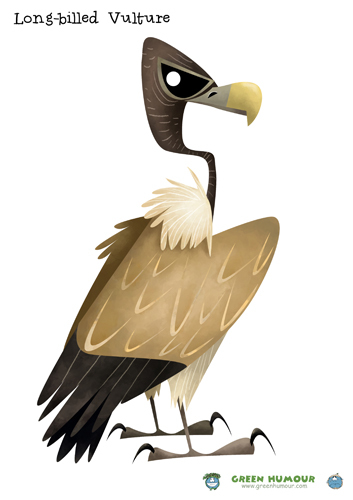 The huge cloak-like plumage of the Cinereous Vulture gives it the nickname 'Monk Vulture'. It is one of the Old World's largest vultures along with the Himalayan Griffon. It is a winter migrant to North-western India. The species is near-threatened. The compilation is available worldwide as prints and a wide range of merchandise from my online store here.